Directions (1 - 5): Study the following information carefully and answer the given questions: The given bar graph shows the number (in thousands) of products manufactured and line graph shows percentage of unsold products by a company over the years 2013 - 2017. 1. What is the average number of product sold in over the years 2013 to 2017? What is the ratio of defective to non defective product of the company in 2017? Statement I: The defective product of the company in 2017 is 80% of the unsold product of company in the year 2015. Statement II: Non defective product of the company in the year 2017 is half of the number of product manufactured in the year 2013. What is the unsold product of the company in 2018? Quantity I: The number of products is manufactured by company in the year 2018 is 120% of the product manufactured in 2016. The ratio of the number of product sold and unsold in the year 2018 is 4 : 3. Quantity II: The number of unsold product in the year 2018 is equal to the number of defective product in the year 2014. And the non defective product of the company in the year 2014 is 80% of the number of product sold in 2013. 4. Sum of the difference between the sold and unsold product in 2014 and 2015 together is approximately what percent more than that of the total number of product unsold in the year 2013, 2016 and 2017 together? 5. What is the average number of products manufactured by company 2014, 2016 and 2017 together? Directions (6 - 10): Each question contains a statement followed by Quantity I, Quantity II and Quantity III. Which of the following should be placed in the blank spaces of the expression “Quantity I__ Quantity II ___ Quantity III” from left to right with respect to the above statements? Quantity I: Ram borrowed the money from Prem at the rate of 12% per annum simple interest. Then Ram deposited that money from the bank of simple interest at 20%. At the end of 18 years, Ram earned the profit of Rs. 540. Find the Sum? Quantity II: The CI and SI on a certain sum for two years at the rate of 5 % is Rs.165 and Rs.150 respectively. Find the sum? Quantity III: A and B started the business by investing Rs. 4000 and Rs. 2000 respectively. After six months A withdrew Rs. 800. The total profit at the end of a year is Rs. 2800, then find the profit share of B? Quantity I: Anu has Rs. 6200 in the form of Rs.10, Rs.50 and Rs.100 notes. The ratio of the number of these notes is 7 : 5 : 3. What is the amount of Rs. 50 notes? Quantity II: The profit earned after selling a mobile for Rs. 2540 is the same as loss incurred after selling the same mobile for Rs.2326. What is the cost price of the mobile? Quantity III: The ratio of the radius of circle and sphere is 1 : 2. The curved surface area of the sphere is 61600 cm. Find the area of the circle? Quantity I: In the year 2017, the ratio of males to females in Kolkata is 4:5. In the year 2018 the male population increased by 20% and the female population increased by 10%. If the total population in the year 2018 was 103000, then find the male population in Kolkata in the year 2018? Quantity II: A dealer purchased a Sofa for Rs. 8100. He allows a discount of 10% on its marked price and still gains 15%. Find the marked price of the Sofa? Quantity III: If the rate of interest increased by 5%, then the simple interest increased by Rs.12000 for 5 years. If the same sum deposited in the bank for 10 years at the rate of 10%, find the simple interest for 10 years? Quantity I: If the ratio of the present age of Ram and Suresh is 7 : 8. After 10 years from now the ratio of Suresh and his sister is 3 : 2. Difference between the ages of Ram and Suresh of after 15 years is 4 years. Then find the Suresh sister’s age after 7 years? Quantity III: 175 m long train crosses another train of length 100 m in 15 sec, running in same direction. If the speed of the first train is 90 km/hr, then find the speed of the second train (in km/hr)? Quantity I: A man can row 20 kmph in still water. If the river is running at 12 kmph, it takes 9 hours more upstream than to go downstream for the same distance. Find the distance? Quantity II: Two trains A and B run in the same direction at 60 kmph and x kmph respectively. If the train A crosses the train B in 20 seconds and the length of train A and train B is 80 m and 120 m respectively. Then find the value of x (Train B is a faster train)? Quantity III: A man travelled a distance of 91 km in 9 hours. He travelled partly on foot at 6 km/hr and partly on bicycle at 12 km/hr. Then find the distance travelled on foot by the man. 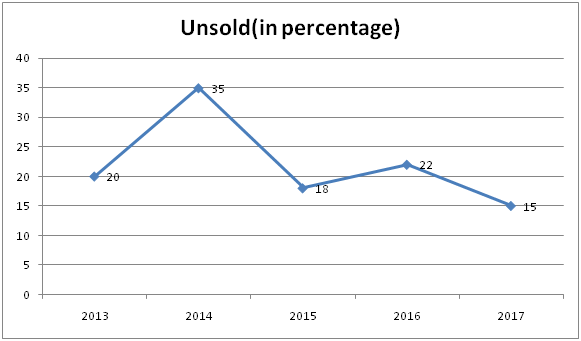 The given bar graph shows the number (in thousands) of products manufactured and line graph shows percentage of unsold products by a company over the years 2013 – 2017. 1) What is the average number of product sold in over the years 2013 to 2017? 2) What is the ratio of defective to non defective product of the company in 2017? 3) What is the unsold product of the company in 2018? 4) Sum of the difference between the sold and unsold product in 2014 and 2015 together is approximately what percent more than that of the total number of product unsold in the year 2013, 2016 and 2017 together? 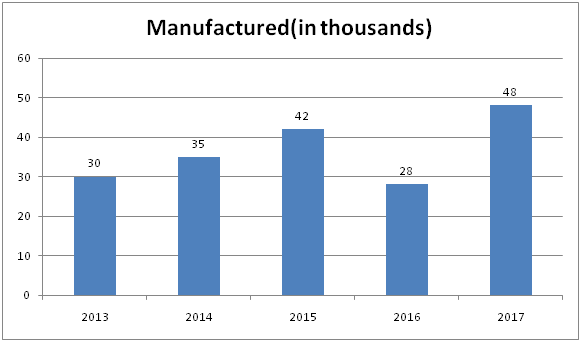 5) What is the average number of products manufactured by company 2014, 2016 and 2017 together? Directions (6 – 10): Each question contains a statement followed by Quantity I, Quantity II and Quantity III. Which of the following should be placed in the blank spaces of the expression “Quantity I__ Quantity II ___ Quantity III” from left to right with respect to the above statements? 6) Quantity I: Ram borrowed the money from Prem at the rate of 12% per annum simple interest. Then Ram deposited that money from the bank of simple interest at 20%. At the end of 18 years, Ram earned the profit of Rs. 540. Find the Sum? 7) Quantity I: Anu has Rs. 6200 in the form of Rs.10, Rs.50 and Rs.100 notes. The ratio of the number of these notes is 7 : 5 : 3. What is the amount of Rs. 50 notes? 8) Quantity I: In the year 2017, the ratio of males to females in Kolkata is 4:5. In the year 2018 the male population increased by 20% and the female population increased by 10%. If the total population in the year 2018 was 103000, then find the male population in Kolkata in the year 2018? 9) Quantity I: If the ratio of the present age of Ram and Suresh is 7 : 8. After 10 years from now the ratio of Suresh and his sister is 3 : 2. Difference between the ages of Ram and Suresh of after 15 years is 4 years. Then find the Suresh sister’s age after 7 years? 10) Quantity I: A man can row 20 kmph in still water. If the river is running at 12 kmph, it takes 9 hours more upstream than to go downstream for the same distance. Find the distance?